Fast working: O-BUSTER FT renders oxygen less than 0.1% in 24 hours. Extended expiration: Extends 3 times of original shelf life. Safe: The ingredients well sealed and packed by special material and technology will never contact food. Printing: The printing for different languages are available as Chinese, Japanese, English, Spanish, French, Thai, and Indonesian. 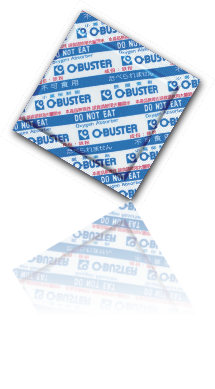 O-BUSTER oxygen absorbers prevent changes in freshness, color and flavor of foods by keeping the environment free of oxygen to maintain the quality and nutrition of foods. O-BUSTER FT is printed in stripes of light blue and white color. Toxic-free: The packing film and ingredients are free of microorganisms, heavy metals and toxic substances which are safe for food contact. The FT-type O-BUSTER is adequate to foods containing water < 40% including pastry, supplements, seasoning, agricultural products, medical articles, feeds, noodles and snacks. The formula of low Aw prevents foods from becoming moldy and dampened with green effects. Please seal oxygen absorbers in the pack in one hour.